The W series from Technical Pro is designed to match Technical Pro Powered loudspeaker line the PW series. The W series uses the same innovative technology and superior construction as the PW by Technical Pro. If you are familiar with Technical Pro, you know that these names are synonymous with power, long lasting design and a superior sound. Technical Pro products are an industry standard for today’s serious audio professional. The W1250 is an ABS molded 12" Two-Way Loudspeaker. Setting up sound and making decisions on what gear to use what speakers to buy how to set them up, etc. can be a hard task. Sometimes you are not interested in anything but a standard speaker. You want your speaker to do one thing properly translate your audio from a standard input connection. If you are a DJ, sound designer, studio designer, event planner, or setting up a sound system for home entertainment or for guests, the W series is for you! Pushing out a total power of 1100 watts, this loudspeaker will be able to provide a thick booming low end and precise acoustic highs at any volume level. The 12" woofer and 40 oz. magnet will move the sound throughout your room or venue with a clean and exact translation! Set them up on the dance floor. Use them for your booth monitor. Set up an outdoor venue. Set up for a speech or conference and point two of these speakers at your crowd. With endless professional uses, the W1250 can be used anywhere you want a professional sound and an assurance that your speaker will last the test of time! The input is speakon and a 1/4" adapter is included. Connect your amplifier and you are all set to push out one of the most cutting edge sound outputs on the market. Inside is a 12" woofer with a massive 40 oz. magnet and a horn driver with a 2" voice coil. This combination will give you that deep, driving bass you want in a club. The horn will precisely translate your high frequencies and you’ll never have to worry if your sound is "muddy" or "cloudy". 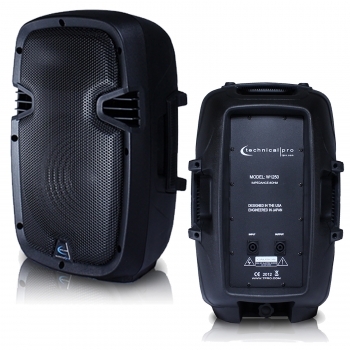 These speakers are perfect in the club or in a classical or jazz music setting. The long-lasting design and innovative technology will guarantee that these speakers remain consistent in sound reproduction in the harshest of conditions! At a price that can’t be beat, this loudspeaker is an absolute must have! The same Studio Monitor Technology used in Technical's PW & ROX Series has been incorporated into W Series. Designed to provide amazing results in a high-impact, molded enclosure, they fill a room with tight, clean-sounding bass, moving massive amounts of air with low resistance. * Dimension: 13" x 24" x 16"